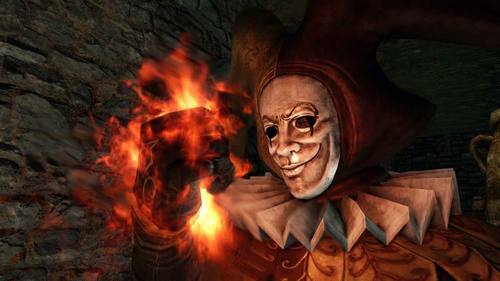 Jester Thomas is an adept pyromancer. He is available as a summonable character against Mytha the Baneful Queen. He will invade the player's world at the bottom of the Dragon Sanctum just before reaching the area with The Imperfect. Jester Thomas is Magerold of Lanafir. 1. Jester Thomas is first encountered in the boss fight against Mytha right before Magerold's position in the Iron Keep, almost as if he made it past there and then stopped his journey. 2. Jester Thomas’ next encounter (for most players) will be in the Dragon Sanctum in Sunken Shulva. We know that Magerold has a powerful love for Dragons, and it may be that this prompts him to attack us when he believes the dragon or the imperfect dragons are being threatened. As if to imply that there’s no way he could be anyone else, which seems like a strangely guilty way to introduce oneself. The evidence against this is that when Magerold is aggroed, instead of attacking the player with pyromancy he will attack them with a scythe and defend himself with a large leather shield. If he had access to such powerful pyromancy it does seem foolish for him to not use it, when he will likely die without it. Though it may be that he did not have his pyromancy hands on him (if that even makes sense?). Despite compelling evidence both ways, no definitive conclusion can be drawn.